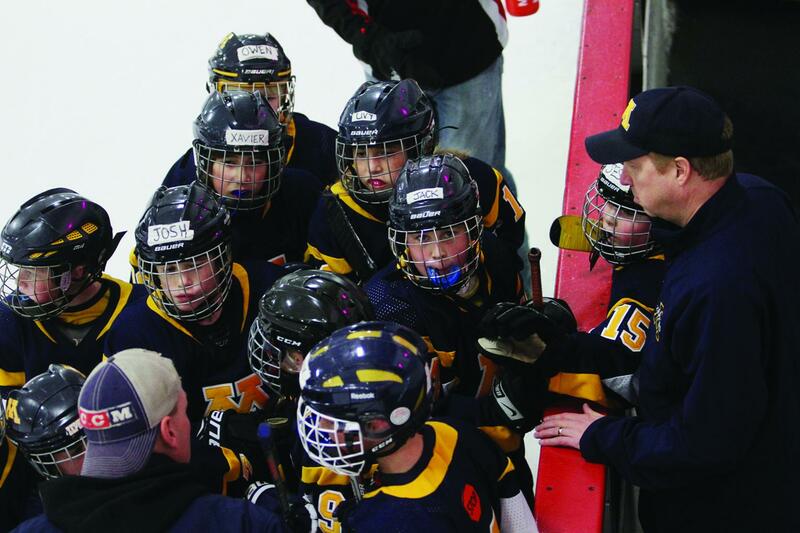 When I coached Bantam teams, our opponents regularly shortened their bench early in the game. We beat a better team in the regional playoffs one year because our opponent only played two of their three lines. We changed our three lines every 30 seconds in the third period and wore them out. When we went through the post-game handshake, there were five cold, dry hands. The last game of the season for them and the third line did not skate a shift. In another instance, the third line never played a shift against us in a scrimmage game in October. In high school games, I see opponents have left the third line sitting for entire games, not to mention the fourth line. In PeeWee B, our opponents routinely shorted the bench, and in one instance, during the first period. Tournaments seem to bring out the short-bench syndrome. So what is this all about? Is it about winning? Perhaps, or maybe it is about not losing. Perhaps the fear of losing is stronger than the joy of winning. I cannot actually understand what is so important that a coach needs to sit a third of the team down in the important games. The impact on those players is devastating. Winning cannot heal the damage. I am often told that the parents and players were told by the coach at the beginning of the season that this might occur and that everybody agreed to it. This is self-serving for the coach because when would a parent or player speak up against a policy like this? After all, every parent and player thinks it will be the other kids who sit out. It is not until it occurs to them that the reality sinks in. By the time it happens, it is too late to object. The parents of the players who are getting the extra ice time are suddenly in favor of the short bench and will not speak up. I know that there are two schools of thought about this. The first is that winning is the salve that heals all wounds. A player relegated to the bench during the championship run should be happy to be along for the ride. The second is that we play all season together as a team and as a team we will finish by playing together. The reality is that the players relegated to the bench simply get bored and lose interest. Who would blame them? At the higher levels of hockey where it is a business and winning actually affects players and coach’s careers, player utilization is accepted by the participants. Players are delegated certain roles and they need to fulfill those expectations. In youth hockey, winning feels good but there are little other benefits other than adult ego gratification. I believe that in youth hockey there is no place for the short bench. A good coach can manage the players so that all of the skaters participate in the game. A good coach will spend extra time with the weaker players throughout the season to improve their skills. A coach who starts the season by talking about skill development, teaching, self esteem and having fun would not break his word by shortening the bench. The short bench is the easy way out for a coach who has not prepared his team properly. Does this mean a youth coach should run the lines 1-2-3? Well, for the most part, yes. I would suggest that a skilled coach can find a way to equal the ice time out. Will some players get more ice time than others? Yes. In fact, some players do not want to be put into the game in pressure situations. Are there specific reasons to reduce ice time for individual players? Yes, there are (discipline or perhaps illness) but to relegate five skaters and a goalie to the bench for extended periods of time in order to win is not a valid reason. In effect, the message to those benched players is that they are being penalized for lack of talent and they are not really part of the team. The game is for the kids, all of the kids. Research nationwide tells us that players would rather play on a team that wins 50 percent of their games than sit on the bench of a championship team while receiving little or no playing time. The bottom line is that all of the kids want to play. Each year we lose 10,000 players nationwide as they move from PeeWees to Bantams. Many cite the reason they quit because they are not having fun. I can personally cite numerous conversations with PeeWee and Bantam parents over the past several years that told me that their boys had played for five or six years and they were about to quit because there is so much pressure to win and it was not fun. I receive numerous e-mails each year from parents upset that their child’s coach was routinely running a short bench. One instance was from the parents of a Squirt C.
This is an issue that needs to be resolved at the beginning of each season. The parents and coaches need to all understand the policy. With a no short-bench policy, there are no problems. If your team is going to have a short-bench policy, perhaps it is better to not have three lines but rather roster only 14 players. That would solve the problem. This one issue alone ruins the season for hundreds of kids and parents each year. Even in victory, it is hollow for the players who sat and watched their teammates play. I know several instances each year where the teams had a problem with the policy in mid-season and the teams fell apart for the rest of the year. Parents of youth players should not put up with short-bench policies. You need to get a commitment from your coaches at the beginning of the year that they will not shorten the bench. Be proactive about this issue at the beginning of the season because once the train leaves the station, it is too late to get off. For more from longtime coach Hal Tearse, go to mminnesotahockey.blogspot.com. Minnesota’s community-based model is one of the primary reasons it’s truly the State of Hockey.